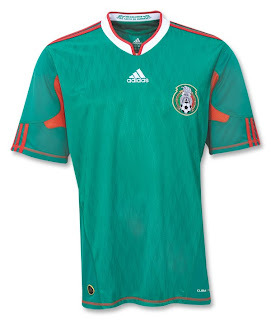 El Tri will be playing in its 14th World Cup in South Africa 2010 - more than any other CONCACAF nation. We're glad to bring Mexico's passionate fanáticos, the latest and greatest Official adidas 09/11 Mexico National Fútbol Team Gear! The new Mexico jersey is a masterpiece of style & performance: with its ultra-modern collar and Aztec sublimated design, plus the red underarm mesh and shoulder stripes add to the special design. It has addias ForMotion: the innovative technology that offers maximum comfort and perfect fit, with features like three-dimensional design, different combination of fabrics for greater flexibility and special stitching to eliminate friction during intense action. Plus, the adidas ClimaCool® - advanced material engineered to reduce heat and moisture build-up, allowing increased comfort and performance – to keep you feeling fresh no matter how long you play, train and cheer on El Tri!